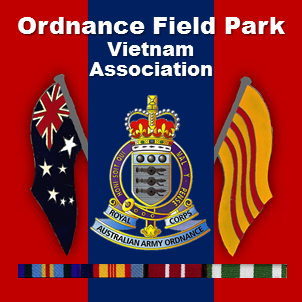 2008 – Unit Plaque Dedication – Ordnance Field Park Vietnam Assn. On Tuesday 14 October 2008, over one hundred and fifty members, family and friends gathered in the Western Courtyard of the Australian War Memorial, Canberra, to witness the dedication of a Commemorative Plaque to recognise the sacrifice and service of the members of the Ordnance Field Park who served with the unit at Nui Dat, Vietnam between 1966 and 1972. The ceremony commenced at 10.00 am with a welcome address by MajGen Steve Gower, Director of the Australian War Memorial. This was followed by prayers by Chaplin Jim Cosgrove, Senior Chaplin – Australian Army Headquarters, and the hymn, “O God our help in ages past”. The Commemorative Address was then delivered by Colonel David Jamison (Ret’d), Honorary Colonel RAAOC – Victoria and Tasmania. David was also the Officer Commanding – 1 Ordnance Park (Det) 1966-67. He spoke about the unit during its tour of Vietnam; the high calibre of the men who served and the special bond that still exists; and the after effects of the war on those who served. A very special moment of David’s address was the conveying of a message of loyal greetings from Her Royal Highness, Queen Elizabeth 11, our Colonel-in-Chief. The unveiling of the Commemorative Plaque was then performed by Les Wilkinson, President – Ordnance Field Park Vietnam Association, and Bob Nash, Association Secretary and Unit Historian. Chaplin Jim Cosgrove then dedicated the Commemorative Plaque. Our special and honoured guest, Brigadier Bob Carson (Ret’d), Honorary Colonel RAAOC – Queensland Region and Representative Honorary Colonel RAAOC, read out the ‘The Ode’ which was followed by the playing of the ‘Last Post’ and one minute’s silence. Everyone then joined in the singing of ‘The National Anthem’ which was followed by Chaplin Jim Cosgrove reciting the Royal Australian Army Ordnance Corps Prayer as the closing prayer of the ceremony. The final part of our ceremony was the ‘Thanks and Farewell’ by our Reunion Co-ordinator Tony Flanagan. •All the members, their families and friends who attended our ceremony. Our Unit Plaque will be a permanent reminder to all Australians of the service and sacrifices made by members of the Ordnance Field Park during its tour of duty in South Vietnam. Our Unit Plaque has now been installed in the Memorial’s grounds. The plaque is located in position number 161 on the Southern side of the pathway leading from the carpark to the Western Courtyard. Refer to the map below.